As recently as a few decades ago, Olympic athletes were bound by rules of competition that forbade them from making money from their sport, part of the International Olympic Committee’s commitment an outdated ideal of an amateur athlete. Those rules were phased out starting in the 1970s, and now we have gone so far in the other direction that many Olympic athletes now pull millions of dollars from endorsements. Off the top of my head I can think of Michael Phelps, Lolo Jones, Hope Solo, Marlen Esparza, Nastia Liukin and Ryan Lochte. For the rare athlete whose existence represents the nexus of modelesque looks and competitive success, Olympic glory can mean lots and lots of money. Consequently it’s sometimes difficult to remember that the vast majority of Olympic athletes will never appear on a box of Wheaties or help design their own line of Target sportswear, a state of affairs that makes training for their chosen sport all the more challenging. This reality was driven home for sports fans this week when a Buzzfeed article about Olympic weightlifter Sarah Robles started making the rounds. Robles is a 23-year-old Californian who can lift the equivalent of an adult male lion over her head. She’s the highest ranked weightlifter in the United States. She represents the United States’ best chance to medal in women’s weightlifting. She does this even though she’s got a congenital problem with her forearm called Madelung’s deformity. And she finds time to blog at Pretty Strong, where she writes a lot about body image and sports. Robles is also struggling to get by, subsisting on $400 a month from USA Weightlifting, discounted groceries from food backs and donations. She has a single sponsor in PowerBar. I thought of her fellow Olympian Holley Mangold while reading this. Mangold, who will also be competing in London, lives in a friend’s laundry room. In response, the internet has once again shown its power to circumvent the corporate mindset that so often shuts down space for diversity of opinions, bodies and ideas. An Indiegogo campaign was set up to help pay for her last few weeks of training, and also to send her coach, Joe Micela, to London so he can be by her side when she competes. The campaign had an initial goal of $2,500 but it has already broken $10,000, and there are still more than three weeks left in the campaign. I fully expect to see that number continue to climb up until the day the campaign ends. Granted, whatever the Indiegogo campaign comes up with can hardly compete with the kind of endorsements given to athletes like Michael Phelps or Shaun White, but I do think the fact that this campaign has taken off the way it has is emblematic of the kind of respect and awe many people feel for hard-working, talented athletes of all kinds, not just the ones who happen to be thin and and American involved in high-profile sports. It is worth asking why an athlete like Robles is financially struggling as much as she is. Certainly she has made some choices, such as passing up free housing at the US Olympic Training Center, that set her back a bit. And of course, she’s not the only Olympic athlete who has chosen to dedicate her life to her sport, as opposed to recreational athletes like me and a lot of the people who read this blog, who fit in our training around our jobs and families and social lives. The vast majority of Olympic athletes are not making a lot of money. In fact, Robles is more the norm than the exception. That said, Robles faces some other obstacles when it comes to making money as an athlete. The first is that she takes part in a sport that – much to my eternal sadness – is not terribly popular in the United States. 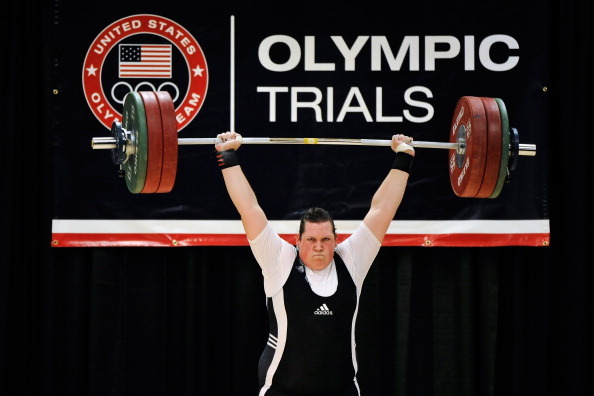 Women’s Olympic weightlifting is relatively new, making its debut in 2000, and only two American women have only ever medaled, including Olympic bronze-medalist Cheryl Haworth. In comparison, women’s boxing, another traditionally masculine sport that has only recently opened to women, has seen a huge amount of media interest in advance of its Olympic debut, which takes place later this month. In addition, boxer Marlen Esparza now has a Cover Girl endorsement. I can only speculate as to why this might be the case, but I imagine that many people are captivated by the idea of young women pounding the crap out of each other in a boxing ring. Weightlifting is just as far outside the realm of traditional femininity as boxing, but it lacks the violence and action that gives boxing its edge. The other obstacle is the fact that Robles, at 5’10” and 275 pounds, does not fit the standard template for beauty that attracts advertisers. She’s pretty, but she’s not thin. We rarely see famous women of size in advertisements, and when we do, it’s usually in connection with something like Weight Watchers, where we are supposed to follow the celebrity’s journey as they shed pounds with the magic assistance of points and prepackaged meals. Advertisers know what to do with someone like Lolo Jones, who is athletic in a way that is still considered marketable. They are at a loss when it comes to someone like Sarah Robles, whose abilities on the platform defies all stereotypes of what it means to be a woman and an athlete. Kick a few bucks her way if you get a chance and show Robles that even though she may not have the backing of Wheaties or Nike, she’s got tons of support from her fans, and while you’re at it, let the advertisers of the world know they are missing out on a chance to back a strong, accomplished athlete. What you can’t quite see is that she’s 35 weeks pregnant – aka, she’s giving birth next month! GO WEIGHT LIFTING. Love this post. I had the incredible fortune of training at her gym, meeting her coaches, and watching her train at her home gym in Mesa, Arizona. They’re all lovely people. She’s extraordinarily talented, focused, and down-to-Earth. I’m hoping that they broadcast enough of her competition. Olympic weightlifting really doesn’t receive nearly enough attention. Thanks for sharing this! These are the kinds of people I think deserve funding the most, and the ones more young girls need to hear about. I don’t give out money lightly but this is definitely someone deserving. This is interesting as there’s been media coverage of our Canadian Athletes struggling with fund raising efforts historically. So to hear of an American athlete who could very well be the best female weightlifter in the world who is struggling this hard is very disheartening from my point of view and I guess the capitalist interest of the use of elite athletes rears its ugly head. It’s too bad that the economic climate is the way it is right now in the US. I wonder how other countries handle this? China would be a prime case study as it’s a POWERHOUSE when it comes to female weightlifting. 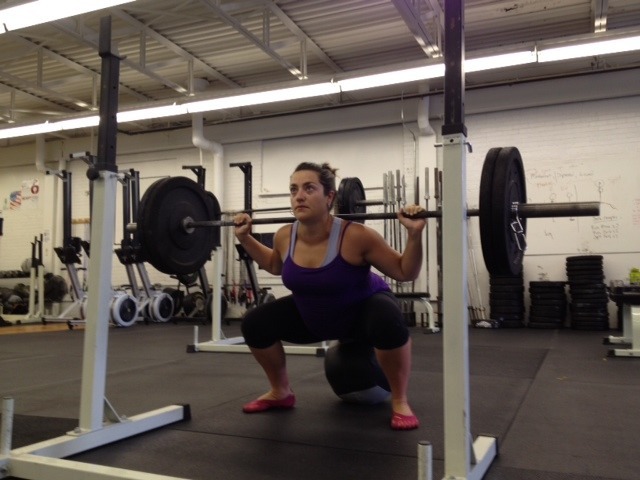 Sarah Robles is a very talented lifter, but she is very far from being one of, let alone the, best lifters in the world. She has an outside shot of getting a bronze and is probably at best the fourth or fifth best lifter in her weight class. Her personal best total of 258 would have placed her 8th at the 2011 world championships. Not all of the lifters who finished above that total will be in London, which is why she has a chance to medal if she has a career day and someone above her has an off day. It is definitely sad how little coverage weightlifting gets (I say this as an amateur lifter). However, there is something to be said for the chicken or the egg problem. The States haven’t produced a better than mediocre lifter in several generations, which has dampened popularity. Likewise, lack of popularity makes it hard to produce elite lifters. Great article! Sarah Robles and the like need our awareness and support! I love her blog, too. She had a great post about her health, dispelling the notion that certain weight/body size equals health. Great to hear that Solve Media is now sponsoring her!